So we’ve all been there……a stressful day at work and you desperately NEED chocolate! Stress eating! Or a stressful afternoon with the children and you NEED biscuits. Or a stressful weekend with the in-laws(!) and you NEED junk food!! I was a master at uni on turning to junk food when I was under pressure and felt overwhelmed, even though at times when I felt good and OK, I loved eating the perceived ‘healthy foods’ So here’s what I’ve learnt over the years about this. Surprisingly this has got nothing to do with lack of willpower and somehow not being strong enough to resist the urges. Whenever we are stressed or overwhelmed or anxious, we are actually wired to crave sugar! (did you know that??) So out come the ‘stress biscuits’ and the ‘overwhelm chocolate’ and the ‘out of control cake’. It’s almost as if we ahem lost control of our mind and no matter how hard we try we can’t resist the urge and the need to eat such things. You haven’t lost your mind BUT no matter how hard you try to override the chemicals and physiological changes in your body, you’ll never win. The sugary treats will. So carrying on from the point above, when we are stressed we often feel like we can’t think straight or clearly. Actually that’s true, we can’t. Stress hormones (adrenaline and cortisol) affect our thought process so much, especially if it is prolonged stress, that often our actions and behaviours seem ‘out of control.’ That would explain why on the one hand you know that eating that huge plate of deep fried chicken might not be what your body wants, but you want it anyway. The stress takes over. 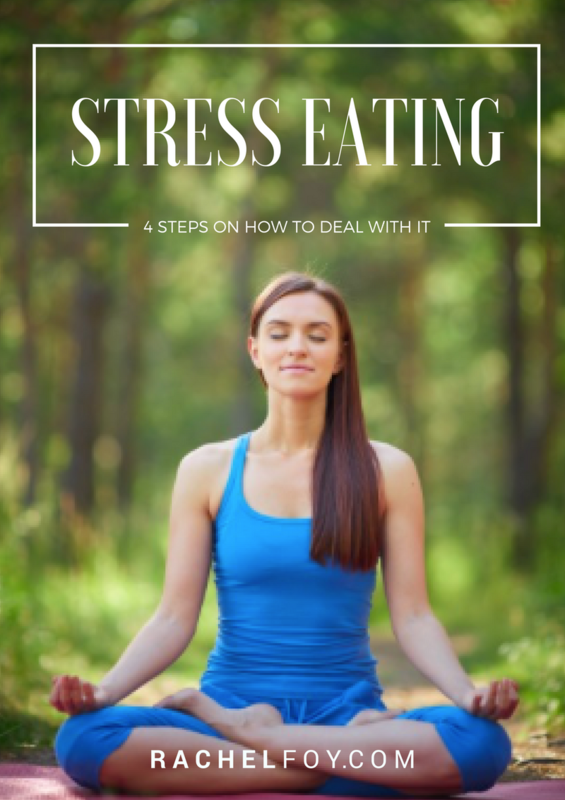 Stress eating is not about the food. It’s not your lack of willpower or your lack of discipline, it’s a real and physiological response to something else. It’s really worth you investing a little bit of self awareness to find out and explore what’s going on underneath the surface of your desire to eat. If it wasn’t about the food, what might it be about? What do I want to avoid right now? What do I really need right now if it isn’t about the food? RELAX! And I mean that metaphorically, cut yourself some slack and be compassionate with yourself that sometimes chocolate really is the answer and there’s nothing wrong with that (once in a while) but also literally. If stress is a HUGE trigger for you to turn to food then how can you start working on changes your response to stress? The less triggered you are by stress, the less likely you’ll NEED food and the more likely you’ll be able to move through that stressful period feeling empowered and calm. Learn to be grounded and in the moment – very much like the tip above how can you learn to start living in the moment and become more grounded and less in your head? This was a BIG thing for me as at the peak of my emotional issue with food and myself, I NEVER lived in the moment. I was forever thinking about tomorrow, what I had to do, the future, all the things on my ‘to do’ list. I still have moments when I go off in the future but I’ve learnt to bring myself back to NOW. Feel your feet on the floor, breath in relaxation and breath our stress and learn to trust that everything will be ok. You are exactly where you are supposed to be right now. 3. Food as your only pleasure? It’s no surprise that when we are stressed and overwhelmed, there is often very little time for US and what we want to do. So honestly, ask yourself, what other things do you have and do in you life right now, which you enjoy and bring you pleasure?? Food should be enjoyable and it should be pleasurable, but when eating a bar of chocolate and a cake, sat in your car in-between meetings, is the only snapshot of pleasure you get in your day, it’s easy to see what food becomes such as issue. If sat on the sofa after a busy, hectic and stressful day at work eating your favourite snacks is also the only thing you have to look forward to, then something is off balance. We stress eat as we feel the emotion inside us. We turn to food as a way of coping with how we feel. We stress eat as we want to change how we feel in the moment. Now the problem with this approach is that it actually doesn’t do anything. That uncomfortable feeling of overwhelm and stress will still be there after you have eaten all of the chocolate, all the chips and all of their crisps. So what can you do about it? I highly encourage you to start learning to become comfortable with being uncomfortable. As an emotional human being it is impossible to avoid our feelings and our emotions, yet sadly so many of us try to do exactly that. Now it is easier said than done but learning to feel your emotions is so important. None of us want to feel stressed, angry, overwhelmed or frustrated but by allowing ourselves to feel how we really feel and acknowledge those emotions, allows those emotions to pass through and to be released. The source of those emotions will probably not change, however, your response to them will and eventually you will learn that you do not need to numb those feelings anymore by turning to food and stress eating. If you truly want to find freedom with food, stop all those obsessive thoughts about food and eating in your head and actually start enjoying life to it’s fullest potential then I hope you take on board (and put into action!) the reasons above. If you are an ambitious, driven and successful business women, entrepreneur/coach who is sick and tired of your food struggles holding you back from having a life and/or business you truly want, then let’s talk. I can help you stop fighting food, your body and yourself so you TRULY can step into alignment with WHO YOU ARE and what YOU WANT! How to enter: Simply leave a comment below and let me know which step you think will be the most useful for you and why?